This article continues a three-part series on the implications of the 2014 farm bill for (1) U.S. commitments on farm subsidies under the current World Trade Organization (WTO) Agreement on Agriculture and (2) current attempts to revitalize the Doha Round negotiations for new WTO trade rules. This article specifically addresses the fiscal costs of the crop insurance program, U.S. notifications of crop insurance to the WTO since 1995, and the potential notification of 2014 farm bill support to the WTO. These considerations take on meaning given the way the 2014 farm bill was materially affected by WTO decisions. Specifically, U.S. cotton does not have access to the ARC and PLC multiple year support programs due to resolution of the Brazilian WTO suit against past U.S. cotton support. Information on U.S. notifications comes from submissions to the WTO Committee on Agriculture (series G/AG/N/USA, available at https://www.wto.org/). The most recent U.S. domestic support notification (G/AG/N/USA/100) is for crop year 2012, submitted December 4, 2014. More extensive information on U.S. crop insurance is at the website of the USDA, Risk Management Agency (RMA). The first article in this series (farmdoc daily July 16, 2015) documents the growth in the U.S. crop insurance program since 1996 and notes some key domestic policy issues that will likely frame the debate on crop insurance for the next farm bill. In particular, the article notes that average annual net insurance payments to farms in excess of the premiums paid by farms (net indemnities) increased from $0.7 billion during the 1996-2000 crop years to $6.8 billion during the 2010-2014 crop years. Other key public costs of the crop insurance program are 1) the government’s share under the Standard Reinsurance Agreement (SRA) of underwriting gains and losses by private insurance companies and 2) reimbursement for private insurance administrative and operating costs (A&O) incurred to deliver the publically subsidized insurance products. 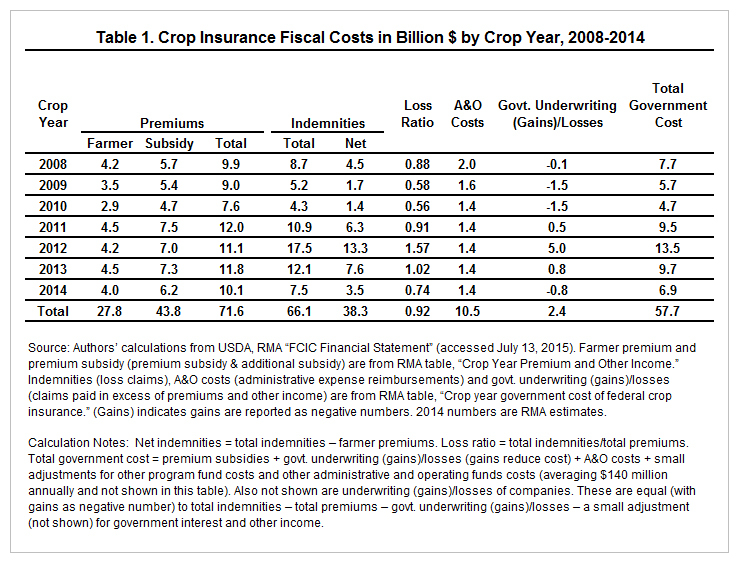 The annual fiscal costs of the crop insurance program are shown in Table 1 for 2008-2014. Net indemnities range from $1.4 billion to $13.3 billion, summing to $38.3 billion over this period. Premium subsidies average $6.3 billion and sum to $43.8 billion. In comparison, total costs range from $4.7 billion to $13.5 billion, summing to $57.7 billion. The most stable cost is A&O which is based on premiums written and is capped under the SRA negotiated in 2010 between the federal government and the private crop insurers. Over the 2010 to 2014 crop years, A&O costs averaged $1.4 billion, or 16% of total government costs. Almost all of the rest of government cost is reflected in the premium subsidies to farms. During the seven years, the government’s underwriting gains and losses resulted in a gain (i.e., reduced the public cost of the insurance program) in four. The one year in which underwriting losses were a major cost to the government over this period was the drought year of 2012. Crop insurance resulted in average underwriting losses to the government of around $0.3 billion over the seven crop years, summing to $2.4 billion. Underwriting gains of the insurance companies averaged $1.2 billion and summed to $8.3 billion (see calculation notes to Table 1). Under the current WTO Agreement on Agriculture, the U.S. faces a single limit of $19.1 billion per year on the sum of certain domestic support as measured by what is known as the “Current Total Aggregate Measurement of Support” (CTAMS). The WTO rules allow calculated “AMS” support to be excluded from counting in the CTAMS if it remains below 5% of the value of production of a product. A second so-called “de minimis” exclusion threshold of 5% applies to general support compared to the total value of agricultural production. The first exclusions are called “product-specific” de minimis; the second is called “non-product-specific” de minimis. Exceeding a de minimis threshold means all of the support (not just support above 5%) is counted. A country must watch each of these constraints, with the key being the limit on CTAMS. Exceeding the CTAMS limit would necessitate the U.S. reducing support to remain in compliance with its commitment, which it can under a “circuit breaker” provision in the 2014 farm bill. Additional rules also determine what support counts in the CTAMS. So called “green box” measures are excluded because they are considered to “have no, or at most minimal trade-distorting effects or effects on production.” Government income insurance programs and relief from natural disasters can be counted in the green box, but only if losses exceed 30% compared to preceding years and if income payments compensate for less than 70% of a producer’s loss. The U.S. has never claimed that its crop insurance payments fit in the green box. From 1995 through 2007, the U.S. notified its total net insurance indemnities as non-product-specific support. The argument was that crop insurance provisions were generally the same for all crops for which insurance was available. During these years, total U.S. non-product-specific support never exceeded the de minimis threshold and thus net indemnities never counted against the U.S. limit on CTAMS. The 2008 farm bill directed the RMA to operate the crop insurance program with the long-run objective of a loss ratio of 1.0 (a reduction from 1.075). With enactment of this bill, the U.S. changed notification method from 2008 to report total annual premium subsidies instead of annual net indemnities as non-product-specific support. A long-run loss ratio (total indemnities/total premiums) of 1.0 means premium subsidies should equal net indemnities over time. Other countries also report crop insurance support as their premium subsidies. Using premium subsidies reduces exposure to high net indemnities. For example, in the drought year of 2012, the U.S. had net indemnities of $13.3 billion vs. premium subsidies of $7.0 billion. The reverse is true when indemnity payments are small. For example, for 2014, the RMA estimates net indemnities of $3.5 billion vs. premium subsidies of $6.2 billion. While the shift in U.S. notification of crop insurance support from net indemnities to premium subsidies is non-trivial, it is consistent with other countries and is justifiable economically. It could result in the U.S. either exceeding or not exceeding its WTO limit for a year. Also starting in 2008, the U.S. began reporting underwriting gains/losses to private insurers and A&O cost reimbursements as “general services” green box expenditures. The underwriting gains/losses to private insurers are not equal to the government’s underwriting gains/losses from insurance in any given year–instead the government and companies share total gains or losses according to the SRA. Hence, the crop insurance costs notified to the WTO do not equal the fiscal cost reported by RMA, even after adjusting for the fact that the WTO green box costs are reported on a fiscal year basis while premium subsidies are reported on a crop year basis. The U.S. made another change in its WTO notifications of crop insurance in 2014. Starting with the 2012 crop year, the U.S. began notifying crop insurance premium subsidies as product-specific support. While this more closely reflects the crop-specific and location-specific character of crop insurance policies, it also is a non-trivial change. To illustrate, for 2012, insurance premiums caused notified product-specific support to exceed the 5% de minimis threshold for 12 crops. Out of total premium subsidies of $7.0 billion, a total of $2.0 billion (mostly for cotton, sorghum and wheat) is thus counted in the CTAMS. Because other crops (except sugar) did not exceed their de minimis thresholds, and because non-product-specific support was below the de minimis threshold, the annual CTAMS was only $6.9 billion, well below the U.S. limit. As with the shift in 2008 to notifying premium subsidies instead of net indemnities, the change to notifying crop insurance as specific to individual crops may work in favor of U.S. farm policy supports staying within its WTO limit in some years and against it in other years. This change, as with the changes in 2008, alters the interaction of U.S. farm policy with WTO requirements. Crop insurance is only one pillar of U.S. farm support and thus is only part of the U.S. support notifications. Commodity programs are another pillar. Under the 2014 farm bill, commodity programs include ARC (Agriculture Risk Coverage), PLC (Price Loss Coverage), and marketing loans. PLC expenditures are likely to be notified as non-product-specific support, just as were expenditures under the price countercyclical program that PLC replaced. ARC expenditures are also likely to be notified as non-product-specific support, unlike expenditures in the ACRE program that it replaced which were notified as product-specific. The change is expected because ACRE made payments mainly on planted acres, whereas ARC makes payments on historical base acres. Marketing loan program payments are likely to be notified as product-specific since they are based on current production and prices. With crop insurance premium subsidies now notified as product-specific support, more room exists to accommodate potentially large year-to-year variability from the PLC and ARC commodity programs without exceeding the non-product-specific de minimis threshold. U.S. cash farm receipts have been within the range of $375-$410 billion in recent years. Using $400 billion as the total value of production, the non-product-specific 5% de minimis threshold is $20 billion. Notified non-product-specific support other than crop insurance or commodity payments has only been around $0.3 billion. Given that ARC was elected on 76% of program base acres and has a cap of 10% of benchmark revenue on its per acre payment, it is unlikely the U.S. non-product-specific support will exceed the de minimis threshold. Thus non-product-specific support under the 2014 farm bill is unlikely to contribute to CTAMS potentially violating the WTO limit. The possible exception will be if prices decline very substantially from current levels and approach the marketing loan rates. The other potential way that the U.S. could violate the WTO limit is if product-specific support from crop insurance, marketing loans, Dairy Margin Protection Program and other programs exceed $19.1 billion. This is unlikely given that insurance premium subsidies, which probably will be the largest of these expenditures, are likely to be less than their recent high of $7.5 billion (for the 2011 crop year) given expected lower crop prices and current insurance policy. Even with crop insurance notified as product-specific support, it will take prices well below the loan rates to generate marketing loan payments large enough to cause product-specific support to exceed the CTAMS limit. Over 75% of the 2008-2014 fiscal cost of U.S. crop insurance is accounted for by premium subsidies to farms and nearly 90% of this cost ended up as net indemnity payments. Thus, if policy determines that cuts in crop insurance are needed, it is reasonable to expect that premium subsidies to farms will draw attention. The WTO has meaning for U.S. farm policy, as underscored by the policy changes made to the U.S. cotton program in the 2014 farm bill in response to Brazil’s successful suit against past cotton support. The Brazil suit rested on price suppression effects of U.S. cotton price and income support programs, not on support exceeding the WTO commitment of the U.S. Nonetheless, the outcome of this case is a warning that farm policy formation cannot ignore existing and future WTO limits and rules about how to count domestic support. The U.S. has markedly changed its method for reporting crop insurance expenditures to the WTO since 2008. These changes have resulted in less variability in the annual amount notified. However, only by knowing a specific year’s data can it be determined if the changes have made it less or more likely that the U.S. will exceed its WTO commitment. The U.S. is unlikely under the 2014 farm bill to exceed its WTO commitment under the current Agreement on Agriculture and current expectations about market prices. However, this conclusion does not hold for the terms that have been negotiated over but never agreed upon in the WTO Doha Round of international trade talks. We turn to this topic in the third and final article in this series. Zulauf, C., and D. Orden. "U.S. Crop Insurance Since 1996." farmdoc daily (5):129, Department of Agricultural and Consumer Economics, University of Illinois at Urbana-Champaign, July 16, 2015.